Prepare for your theory test with our free practice highway code test series. Our tests include explanations alongside each question to ensure you correctly understand the rules. Statistics show only around half of the people sitting the test actually pass! 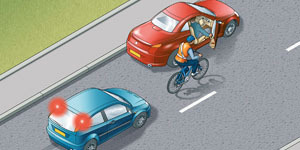 Improve your chances with our highway code test study series. When you check the tyre pressures do so when the tyres are cold. This will give you a more accurate reading. The heat generated from a long journey will raise the pressure inside the tyre. You should always give cyclists plenty of room when overtaking. When it’s windy, a sudden gust could blow them off course. 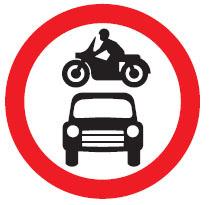 A sign will indicate which types of vehicles are prohibited from certain roads. Make sure that you know which signs apply to the vehicle you’re using. 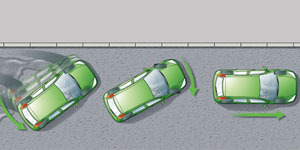 You should keep to the left and only use the right-hand lane if you’re passing slower- moving traffic. When surface spray reduces visibility switch on your dipped headlights. This will help other road users to see you. Stay with the casualty and talk to them quietly and firmly to calm and reassure them. Avoid moving them unnecessarily in case they are injured. Keep them warm, but don’t give them anything to eat or drink. When driving on a motorway or slip road, you must not enter into an area marked with chevrons and bordered by a solid white line for any reason, except in an emergency. Unless shown otherwise, the speed limit on a motorway applies to all the lanes. Look out for any signs of speed limit changes due to roadworks or traffic flow control. Do not overtake until the vehicle begins to turn. Do not overtake when at or approaching a junction. Hold back and wait until the vehicle has turned before proceeding. 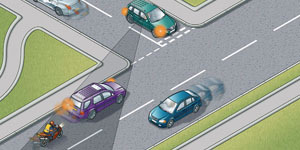 Do not overtake because the vehicle turning left could hide a vehicle emerging from the same junction. If you can’t get your vehicle onto the hard shoulder, use your hazard warning lights to warn others. Leave your vehicle only when you can safely get clear of the carriageway. Do not try to repair the vehicle or attempt to place any warning device on the carriageway. When parking at night, park in the direction of the traffic. 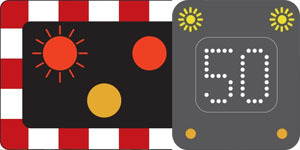 This will enable other road users to see the reflectors on the rear of your vehicle. Use your parking lights if the speed limit is over 30 mph. Make a note of the date that your MOT certificate expires. Some garages remind you that your vehicle is due an MOT but not all do. 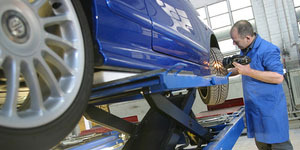 You may take your vehicle for MOT up to to one month in advance and have the certificate post dated. The purpose of this road marking is to keep the junction clear of queuing traffic. You may only wait in the marked area when you’re turning right and your exit lane is clear but you can’t complete the turn because of oncoming traffic. Letting your vehicle roll or coast in neutral reduces your control over steering and braking. 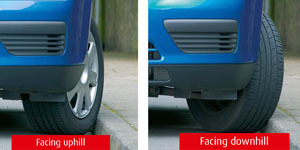 This can be dangerous on downhill slopes where your vehicle could pick up speed very quickly. Make sure that you have reduced your speed and are in the correct gear for the turn. Look into the road before you turn and always give way to any pedestrians who are crossing. This distance is the equivalent of 18 car lengths. Try pacing out 73 metres and then look back. It’s probably further than you think. Use a liquid that is clean, cold and non- toxic, preferably water. Its coolness will help take the heat out of the burn and relieve the pain. Keep the wound doused for at least ten minutes. If blisters appear don’t attempt to burst them as this could lead to infection. There is usually a 30 mph speed limit where there are street lights unless there are signs showing another limit. If you’re travelling in a one-way street and wish to turn right you should take up a position in the right-hand lane. This will enable other road users not wishing to turn to proceed on the left. Indicate your intention and take up your position in good time. When going down a steep hill your vehicle will speed up. This will make it more difficult for you to stop. Select a lower gear to give you more engine braking and control. Use this in combination with careful use of the brakes. If you follow another vehicle with your headlights on full beam they could dazzle the driver. Leave a safe distance and ensure that the light from your dipped beam falls short of the vehicle in front. Potholes and bumps in the road can unbalance a motorcyclist. 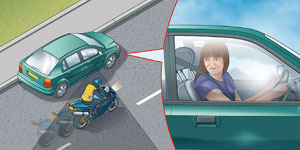 For this reason the rider might swerve to avoid an uneven road surface. Watch out at places where this is likely to occur. Wet roads will reduce your tyres’ grip on the road. 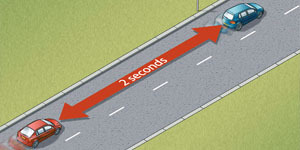 The safe separation gap of at least two seconds in dry conditions should be doubled in wet weather. 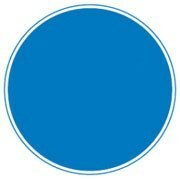 Signs with blue circles mostly give a positive instruction. These are often found in urban areas and include signs for mini-roundabouts and directional arrows. Would you like free study reminders? We'll email you a different practice test every day for two weeks to help you ace your test. Yes please, and I consent to my submitted data being collected and stored. Staying alert, avoiding distractions, mirrors, recognising blind spots. 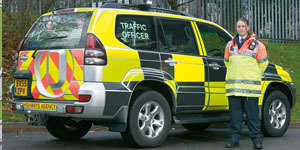 Following distances, pelican crossings, headlights, responding to other road users. Licences, MOT certificates, theory tests, SORN, fines, vehicle registration, insurance. 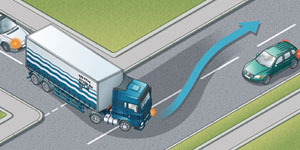 Braking distances, wind/snow/wet weather conditions, overtaking. Recognising and responding to hazards such as other road users, and fixed hazards. Responding to other vulnerable road users such as cyclists and pedestrians. Behaviour of other types of vehicles such as lorries and buses. Handling your vehicle under more difficult conditions and circumstances. Joining and exiting, lane choice, overhead signals, Active Traffic Management. 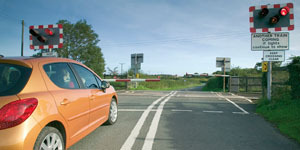 Speed limits, junctions, parking, roundabouts, level crossings. Signs and signals from across the Highway Code. Tyre pressures, fuel consumption, route planning, emissions. Responding to accidents whether you are involved or an observer. 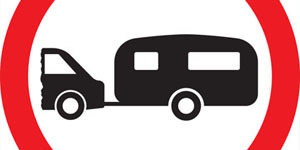 Towing, roof racks, vehicle loading, caravans, trailers. How old do you have to be to take the theory test? You can take the theory test when you are 17 years of age. How can I book my theory test? What does the theory test involve? You take them as a single test and you need to pass both of them to pass the test. What do I need to study? So these are what you need to study to ensure you know all the rules and skills that will appear in the test. Our website also includes the official revision test questions (almost a thousand of them) so it’s a great place to start coming to grips with it all. When you’re ready, you can try a free mock theory test. Where do these questions come from ? These questions come from the DVSA revision question bank. Crown copyright material reproduced under licence from the Driver and Vehicle Standards Agency, which does not accept any responsibility for the accuracy of the reproduction. When can I take my driving test? You can take your driving test once you’ve sat and passed your theory test. 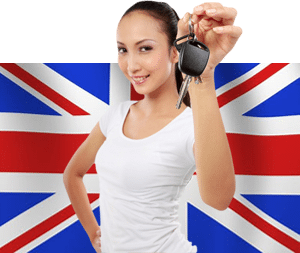 How do I get my provisional driving licence? You can easily apply for this online directly from the DVSA. How much does it cost to get a driving licence? 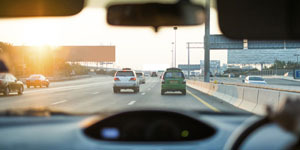 View the latest fees relating to getting a driving licence. How old do you have to be before you can begin learning to drive? You can apply for a provisional driving licence from the age of 15 years and 9 months. And you can start driving a car when you’re 17. Where can I find a driving school or driving instructor? You can find driving instructors in your area that have been approved by the DVSA. Search for an instructor or driving school. Do I have to use L plates? Make sure you use the correct one as there are penalties if you don’t get it right. Highway Code Test © 2013-2019 All Rights Reserved. Contains public sector information licensed under the Open Government Licence v2.0.